i'm feeling a little under the weather so it's samahan to the rescue. i was never a big believer in this herbal remedy that my parents would push on me when i was sick in the past. until one day i drank some, alone in my apartment, with my lungs on fire. as soon as i took a hot sip, i felt…well, like my lungs were on fire. but this time in a good way. it felt like my lungs got instantly warm and like something good was about to happen to them. i got better sooner than i thought i would. right now my throat is scratchy and the samahan isn't making my lungs feel warm, it's making my throat feel clearer. perhaps that's all in my head but in my head is where the "i feel like crap" perception lives so this works for me. 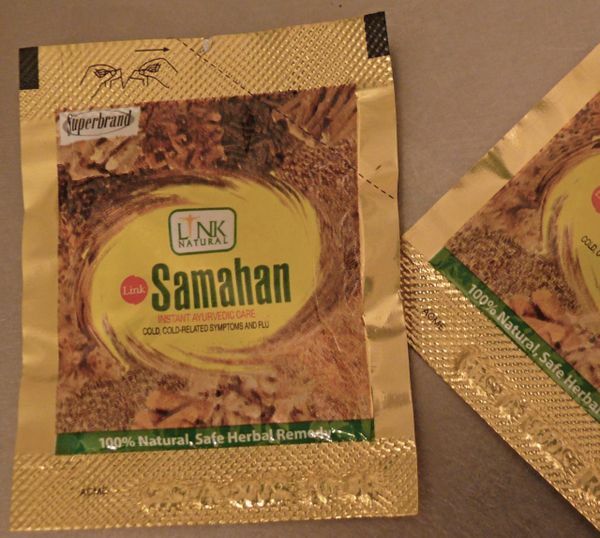 samahan's an all-natural ayurvedic powder of ground pepper, ginger, corriander, cumin and a bunch of things i don't recognize. but i just found the producer's website. contains things one might find in a curry if you ask me. and it's almost as pleasant to consume. work your magic, samahan! i gots things to do. You can now buy Samahan from any where in the world and get it shipped directly from Sri Lanka. The Samahan tea bags could be used for up to two years.